67 Is A Lot Of Points! Now, on with the football league news! The Washingtons beat some wildcats and the Saskatchewans prevailed against some golden bears. About those Saskatchewans, they scored 67 points against the golden bears' 3 points! That's what I'd call a decisive victory! 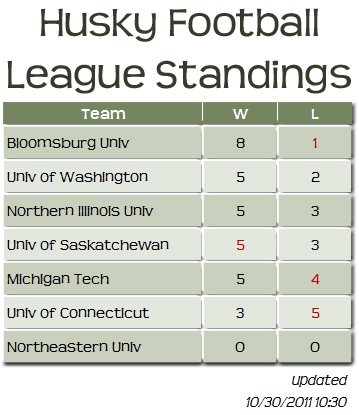 I have some sad news: The Bloomsburg Turbo-Colored Huskies did not win against some pioneers. The Michigan Techs did not defeat some lakers and the Connecticuts did not beat some panthers. The Northern Illinoises will be taking on some rockets on Tuesday night. 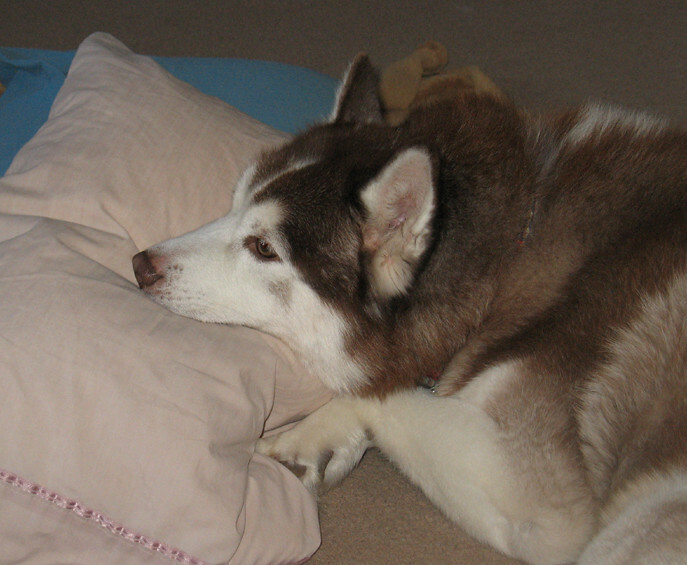 A couple of the games were played later yesterday, so I decided to dig some holes and nap. I knew I could post about them this morning. The Washingtons had their 2nd non-win against the color of cardinal (not the bird). 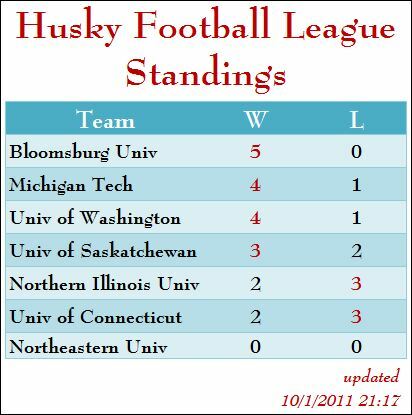 I feel the need to add that Turbo-Colored Huskies of Bloomsburg had a particularly thrilling victory. They didn't score any points in the 1st quarter. A couple of minutes into the 2nd quarter, the golden rams were up 35 points to 0. But at that point the Bloomsburgs started scoring lots of points. The final score was 55 Bloomsburg points to 42 golden rams points. 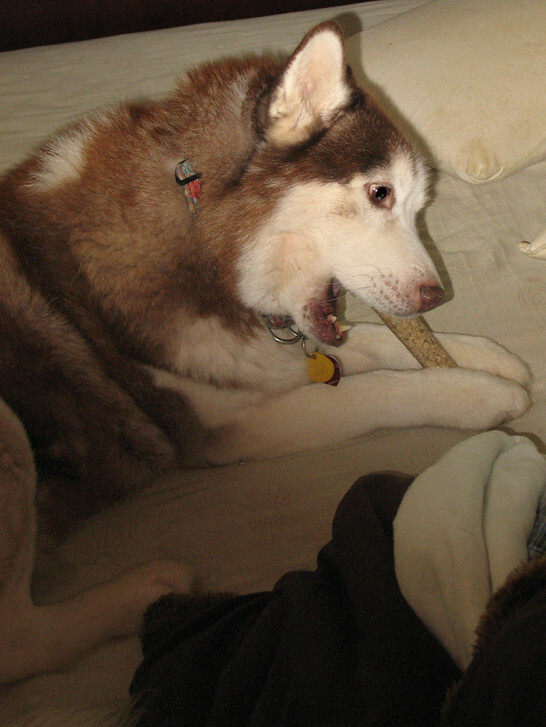 I want to step away from the sports page to pay tribute to a Dogs With Blogs family member who has left our world to join our friends across the rainbow bridge. 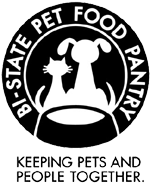 Claudette Hudson had been a long time member of DWB at Lacy Lulu & Rocky's human. I doubt anydog or anyhuman has ever met a kinder being than Claudette. Although all of us who got to know Claudette are sad that she is no longer with us, we know that she is having a great time with all our friends who are playing on the other side of the rainbow bridge. 4 Wins & 2 Non-Wins! 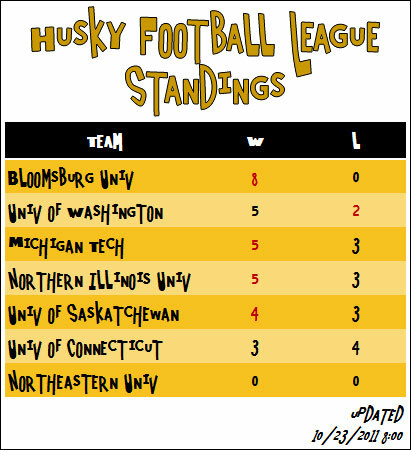 So Huskies again won more games than they didn't win. I'd call that a good weekend. 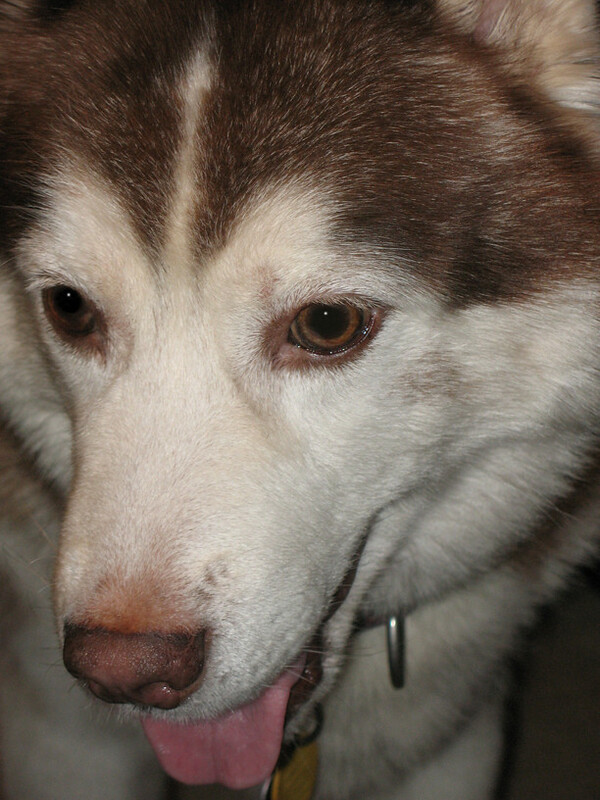 Of course I remain pleased that the Turbo-Colored Huskies of Bloomsburg remain undefeated. The Washingtons, Northern Illinoises, & Connecticuts also were winner. 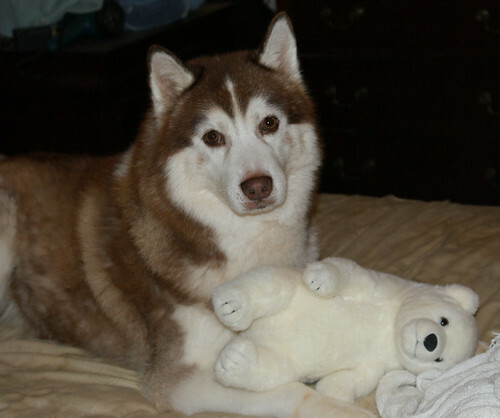 (These winning Huskies beat raiders, buffalos, broncos, & bulls). I'm sad to report that the Michigan Techs and Saskatchewans were non-winners to some chargers & dinosaurs (that remain unextinct). See the difference? 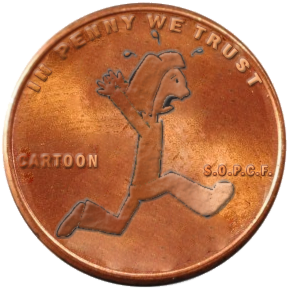 Here's what the mascot does look like! So! 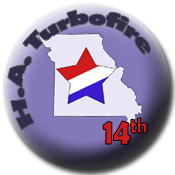 2 HFL teams won, 2 didn't win, and 2 didn't play. 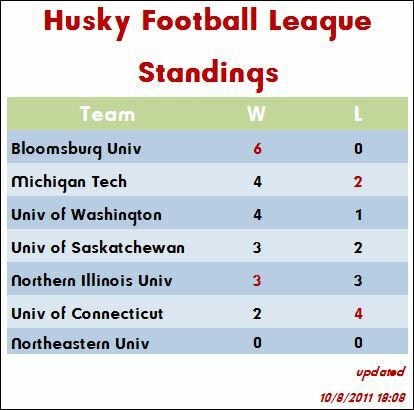 The Bloomsburg Turbo-Colored Huskies beat up some wolves (sorry wolves!) and the Northern Illinoises destroyed some golden flashes. I still agree with a statement I made back in 2007 that "Golden Flash" sounds like the name of a superhero that runs and pees! Unfortunately, the Michigan Techs got a non-win against some stupid cardinals! And the Connecticuts did not score more points than some mountain ears. Both the Washingtons & the Saskatchewans decided to nap today rather than play. 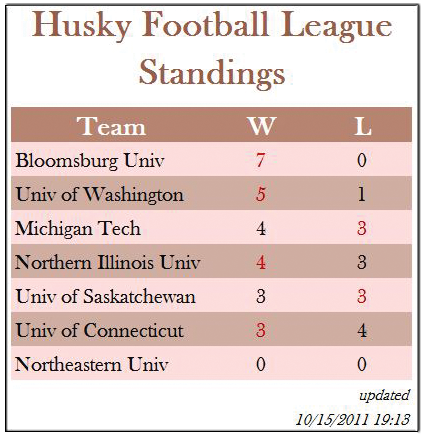 So the 5th week of the Husky Football League season occured this week. 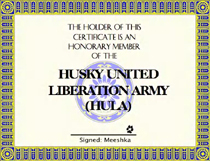 I'm happy to report that huskies defeated 67% of their opponents this week. 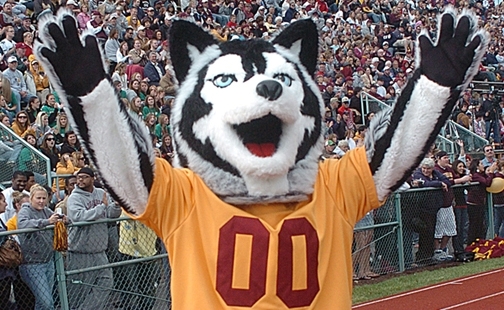 The victorious huskies were the undefeated Turbo-Colored Huskies of Bloomsburg, Michigan Tech, Washington, & Saskatchewan. These huskies ruined the weekend of warriors, panthers, (sorry Huffle), utes, & thunderbirds. The Northern Illinoises & Connecticuts both lost sadly to chippewas & broncos. But they both came didn't lose by much - only 7 points a piece.